One of the hottest up-and-coming producers in hip hop, WillPower has produced for the likes of Eminem, Wiz Khalifa, Yelawolf and Slaughterhouse. He recently came to the attention of Technicians everywhere with his beat for the Strange Music fan-favorite “Delusional” from Tech N9ne’s breakthrough album All 6’s and 7’s. With his production on “Dollar General” from Stevie Stone’s upcoming Strange Music debut Tech N9ne Presents Stevie Stone – Rollin’ Stone, Will Power has further solidified himself as a producer to keep an ear out for. We talked to Will Power to get his perspective on the thumping track and moody track for Rollin’ Stone. You produced this song “Dollar General”, how did that come about? Basically I sent Strange Music beats. I was in the studio with Tech N9ne last year working on his album and I built a really good relationship with Strange Music so anytime I had a chance to send beats out I would hit up Richie Abbott or even Tech himself and just shoot beats out and see if he liked them. That particular record was one of Richie Abbot’s favorites. Did Yelawolf record the hook on this first? Yeah. I actually had that hook prior to the presentation of the record. It was just a great concept and I think that was part of what got them interested was just the fact that it was so crazy of a concept. Very few people would openly be like “Let’s go rob the dollar general.” Yelawolf is one of my best friends man so I have the luxury of having some really great ideas that we’ve done together, that I’m able to share with people and introduce him to people and introduce people to him. I think it’s the perfect marriage on the record. Stevie killed it. He went where I didn’t think he would go. I think it was really really dope how he handled that record. I think it’s a masterpiece man. 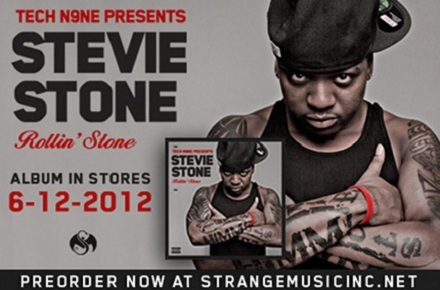 What do you think about Stevie Stone? Did you know much about him before you heard him on this track? What things about him kind of impress you as an artist at least from what you’ve heard so far? I just think it’s the honesty. It’s the honesty in his music. That translates the most to me and I think that’s part of what I love about Strange Music as a whole. Most of the artists on the label speak from a real creative place and there’s a lot of honesty in their music. What do you think of WillPower and the beat he laced for “Dollar General”?